Progressive Charlestown: Are Trump Supporters Too Dumb To Know They’re Dumb? 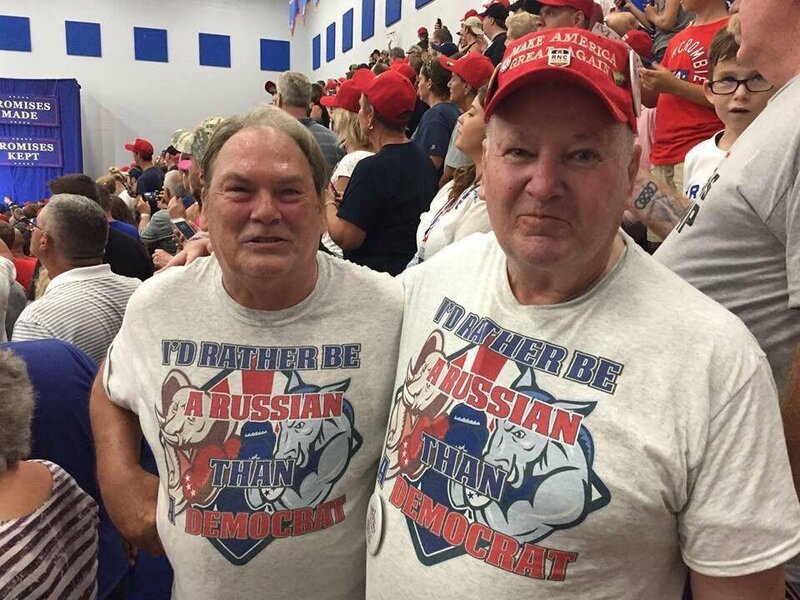 Are Trump Supporters Too Dumb To Know They’re Dumb? How the hell can anybody call themselves intelligent when they’re supporting Donald Trump? It’s a question that baffles people who are able to think critically, able to read and comprehend both history and current events, and able to see through Trump’s thin façade of know-it-all-ism and deep into what he is – an ignorant, narcissistic, and dangerous conman. Trump supporters not only don’t see this, they’re happy that there’s someone running for president that thinks exactly like them. Take Melanie Austin, of Brownsville, Pennsylvania. She thought her beliefs about Obama being a gay Muslim from Kenya and Michelle being transgender were just fringe beliefs – right up until she started hearing similar stuff from Trump and other right-wing extremists. Now she knows she’s right about all of this. You can’t tell her that she’s ignorant and dumb if she can’t figure this out for herself. You can’t tell her she’s delusional. You can sit there with her, and countless others like her, and present facts, figures, charts, studies, and more, all from the most reputable sources there are, and prove that her lord and savior is wrong, and you’ll still get shot down. There’s more to this than the problem of confirmation bias. Austin gets much of her information from fringe right-wing blogs and conspiracy sites, but that’s not all of it. Many of Trump’s supporters are seriously too dumb to know they’re dumb. It’s called the Dunning-Kruger effect, and it’s an unshakeable illusion that you’re much smarter, and more skilled and/or knowledgeable, than you really are. People like Austin labor under the illusion that their knowledge about things is at least as good as, if not better than, the actual facts. For these people, though, their knowledge isn’t just superior – it’s superior even to those who have intimate and detailed knowledge of the subject at hand. Trump himself has exemplified this countless times, such as when he claimed he knows more about ISIS than even our military generals do. So basically, yes, it’s possible to be too dumb to realize you’re dumb. In four separate studies, people who scored in the bottom quarter on tests involving everything from humor to logic, and even to grammar, grossly overestimated where they thought they would score. They averaged scores in the 12th percentile, while their average estimate of their own scores was the 62nd percentile. Take the case of McArthur Wheeler, a man who robbed two banks in 1995 and was caught rather easily. He thought he would get away with it because he rubbed his face with lemon juice, which is used in invisible ink. To test the theory that lemon juice would turn him invisible, he rubbed it on his face, took a Polaroid, and his face wasn’t in the picture! So he thought he was safe from security cameras because he could make his face invisible. “It suggests that some voters, especially those facing significant distress in their life, might like some of what they hear from Trump, but they do not know enough to hold him accountable for the serious gaffes he makes. They fail to recognize those gaffes as missteps. Trump is completely inept, and his supporters are way too poorly-informed to know that he’s inept, and too dumb themselves to know how dumb they are. That’s why Trump’s supporters are so sure they’re smart and their president is smart that they won’t listen to reason. The effect is strong in these people.